Should I have a drink? Hmmm I don't really drink... I decided to make myself some noodles. I found a couple of "I will be leaving you soon" heirloom tomatoes in the fridge. I was thankful to have some Swiss chard and thyme in my Week 11 CSA. I made a pasta sauce with Swiss chard, tomatoes with a splash of cream (OK, I only had half and half) and vodka. I also threw in some basil from the garden, thyme and garlic. Top with Parmesan cheese of course! I only had grated cheese in the fridge, guess I would make to do. I didn't get a chance to measure and I am using what was available in the fridge. I will post a proper recipe soon. If you like to cook, most like you will easy figure this out. 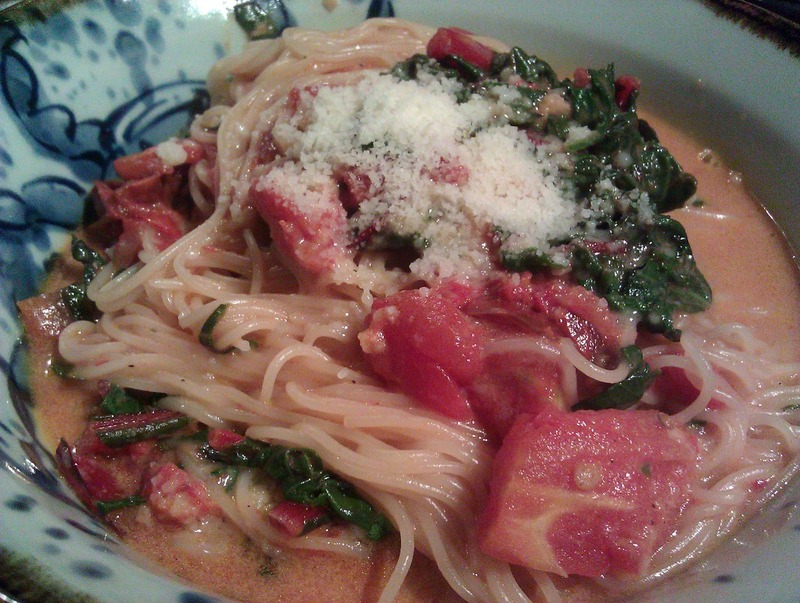 Swiss Chard and Heirloom tomatoes Angel hair pasta with Vodka cream sauce.